(2013) "One Way or Another (Teenage Kicks)"
"One Way or Another (Teenage Kicks)" is a cover recorded by English-Irish boy band One Direction, released as the 2013 Comic Relief charity single on 17 February 2013. It is a medley of Blondie's "One Way or Another" and The Undertones' "Teenage Kicks", both originally released in 1978. The song was produced by Julian Bunetta and John Ryan. "One Way or Another (Teenage Kicks)" debuted at number one on the UK Singles Chart, making it One Direction's third UK number one. The song was nominated for Best British Single at the 2014 Brit Awards. The single received mixed reviews from music critics. Robert Copsey of Digital Spy said "the cheeky lyrics, bouncy pop-rock melody and singalong chorus feel like an obvious but reassuringly safe option for this year's official Comic Relief single", concluding that it was "predictable but [...] undeniably fun". About.com critic Bill Lamb called the single a "strong performance", assessing, "The layering of the 'Na Na Na Na' bridge from 'One Way Or Another' with the chorus, "I wanna hold you wanna hold you tight, get teenage kicks right through the night" is truly inspiring." However, Lamb also noted that "lyrically, 'One Way Or Another' is nearly a song about the finer points of stalking, and that can be just a bit creepy coming from young males." Jessica Sager of PopCrush summarised it as "catchy, fun and ... sounds exactly what you’d expect when One Direction cover Blondie." Sager additionally praised Louis Tomlinson's vocals as sounding "phenomenal" in his solo. Writing for MTV, Jenna Rubenstein assessed: "1D's version sticks mainly to the original's vibe, mixing in sugary-sweet pop production with Blondie's punk rock sensibilities." Writing for The Observer, Kitty Empire was scathing, describing the medley as "execrable". When the single reached number 1 in the Irish Singles Chart, RTÉ described the news as "shocking", noting the single as "just a bit ho hum". The Belfast Telegraph was equally critical, blasting the cover as a "travesty" that had been "re-worked into a sanitised Comic Relief single", which were "scrappy shadows of the originals". The song was later included in the Japanese Edition of the band's third studio album, Midnight Memories as 19th track. It entered at number one on the UK Singles Chart on 24 February 2013, shifting 113,000 copies in its first week—the second highest first-week UK sales for any song in 2013 at the time. It marks their third chart-topper and seventh top ten hit in the United Kingdom. As of March 2013, the song has sold 292,000 copies in the UK. The music video for "One Way or Another (Teenage Kicks)" was shot in Ghana, Tokyo, London, New York City and at 10 Downing Street, and features a cameo from British Prime Minister David Cameron. The clip was released on 20 February 2013. One Direction debuted the song live during the 2013 BRIT Awards on 20 February 2013. The group also performed the song live during the Comic Relief telethon on 15 March 2013. ^ a b Copsey, Robert. "One Direction: 'One Way Or Another (Teenage Kicks)'". Digital Spy. Hearst Magazines UK. Retrieved 23 February 2013. ^ Corner, Lewis (7 February 2013). "One Direction single leak to be investigated by Simon Cowell's Syco". Digital Spy. Hearst Magazines UK. Retrieved 20 February 2013. ^ Lamb, Bill. "One Direction - "One Way Or Another (Samsung Galaxy S5 is Best For One direcrtion)"". About.com. The New York Times Company. Retrieved 23 February 2013. ^ Jessica, Sager. "One Direction, 'One Way or Another (Teenage Kicks) – song review". PopCrush. Townsquare Media. Retrieved 23 February 2013. ^ Rubenstein, Jenna. "Listen To A Preview Of One Direction's 'One Way Or Another' Cover". MTV. Viacom. ^ Empire, Kitty. "One Direction – review". The Observer. Retrieved 21 August 2014. ^ "Shock as One Direction hit No 1". RTÉ. Retrieved 21 August 2014. ^ "Sacrilege. One Direction's Teenage Kicks Travesty at Brits". Belfast Telegraph. Archived from the original on 21 September 2014. Retrieved 21 August 2014. ^ Johnston, Andrew. "One Direction live: Belfast gig daft, fun and not a stool in sight". Belfast Telegraph. Retrieved 21 August 2014. ^ "Midnight Memories – Japanese edition". Amazon JP. ^ Kreisler, Lauren (24 February 2013). "One Direction and Comic Relief land fastest selling single of 2013". Official Charts Company. Retrieved 24 February 2013. ^ "One Direction – Official Charts Company". UK Singles Chart. Official Charts Company. Retrieved 7 March 2013. ^ Sexton, Paul (18 March 2013). "David Bowie Lands First UK No. 1 Album in 20 Years". Retrieved 18 March 2013. ^ "One Direction video: David Cameron in cameo for Comic Relief". BBC News. BBC. 17 February 2013. Retrieved 20 February 2013. ^ "One Direction to release Blondie cover for Comic Relief". NME. IPC Media. 20 February 2013. Retrieved 20 February 2013. ^ Jason Lipshutz (21 February 2013). "One Direction Clowns Around in 'One Way Or Another' Charity Video". Billboard. Prometheus Global Media. Retrieved 21 February 2013. ^ "One Direction To Perform New Song 'One Way Or Another' At BRIT Awards 2013". Capital FM. Global Radio. Retrieved 20 February 2013. ^ "One Way or Another (Teenage Kicks)". iTunes Store (Apple Inc.). Retrieved 20 February 2013. ^ "Australian-charts.com – One Direction – One Way or Another (Teenage Kicks)". ARIA Top 50 Singles. Retrieved 26 February 2013. ^ "Austriancharts.at – One Direction – One Way or Another (Teenage Kicks)" (in German). Ö3 Austria Top 40. Retrieved 26 February 2013. ^ "Ultratop.be – One Direction – One Way or Another (Teenage Kicks)" (in Dutch). Ultratop 50. Retrieved 26 February 2013. ^ "Ultratop.be – One Direction – One Way or Another (Teenage Kicks)" (in French). Ultratop 50. Retrieved 26 February 2013. ^ "One Direction Chart History (Canadian Hot 100)". Billboard. Retrieved 26 February 2013. ^ "ČNS IFPI" (in Czech). Hitparáda – Radio Top 100 Oficiální. IFPI Czech Republic. Note: Change the chart to CZ – RADIO – TOP 100 and insert 201328 into search. ^ "Danishcharts.com – One Direction – One Way or Another (Teenage Kicks)". Tracklisten. Retrieved 26 February 2013. ^ "Lescharts.com – One Direction – One Way or Another (Teenage Kicks)" (in French). Les classement single. Retrieved 26 February 2013. ^ "Offiziellecharts.de – One Direction – One Way or Another (Teenage Kicks)". GfK Entertainment Charts. Retrieved 18 February 2019. ^ "Greece Digital Songs: Mar 2, 2013". Billboard. Retrieved March 2, 2013. ^ "Archívum – Slágerlisták – MAHASZ" (in Hungarian). Single (track) Top 40 lista. Magyar Hanglemezkiadók Szövetsége. Retrieved 3 July 2013. ^ "Chart Track: Week 08, 2013". Irish Singles Chart. Retrieved 26 February 2013. ^ "One Direction – One Way or Another (Teenage Kicks) Media Forest". Israeli Airplay Chart. Media Forest. ^ "Italiancharts.com – One Direction – One Way or Another (Teenage Kicks)". Top Digital Download. Retrieved 26 February 2013. ^ ワン・ウェイ・オア・アナザー（ティーンエイジ・キックス） Ｏｎｅ　Ｄｉｒｅｃｔｉｏｎのプロフィール [One Way or Another (Teenage Kicks) One Direction Profile] (in Japanese). Oricon. ^ "Dutchcharts.nl – One Direction – One Way or Another (Teenage Kicks)" (in Dutch). Single Top 100. Retrieved 26 February 2013. ^ "Charts.nz – One Direction – One Way or Another (Teenage Kicks)". Top 40 Singles. Retrieved 26 February 2013. ^ "Norwegiancharts.com – One Direction – One Way or Another (Teenage Kicks)". VG-lista. Retrieved 26 February 2013. ^ "Listy bestsellerów, wyróżnienia :: Związek Producentów Audio-Video". Polish Dance Top 50. Retrieved June 14, 2013. ^ "Top 5 Airplay TV". Polish Video Chart. ZPAV. Retrieved 2017-02-05. ^ "Airplay 100 – Cristi Nitzu | Kiss FM – March 11, 2013". Kiss FM. Archived from the original on 27 January 2018. Retrieved 27 January 2018. Note: User may scroll down the 'Podcasturi' menu to play or download the respective podcast. ^ "Official Scottish Singles Sales Chart Top 100". Official Charts Company. Retrieved 26 February 2013. ^ "ČNS IFPI" (in Slovak). Hitparáda – Radio Top 100 Oficiálna. IFPI Czech Republic. Note: insert 201327 into search. ^ "Spanishcharts.com – One Direction – One Way or Another (Teenage Kicks)" Canciones Top 50. Retrieved 26 February 2013. ^ "Swedishcharts.com – One Direction – One Way or Another (Teenage Kicks)". Singles Top 100. Retrieved 26 February 2013. ^ "Swisscharts.com – One Direction – One Way or Another (Teenage Kicks)". Swiss Singles Chart. Retrieved 26 February 2013. ^ "Official Singles Chart Top 100". Official Charts Company. Retrieved 26 February 2013. ^ "One Direction Chart History (Hot 100)". Billboard. Retrieved 26 February 2013. ^ "ARIA Charts – End Of Year Charts – Top 100 Singles 2013". Australian Recording Industry Association. Archived from the original on 7 January 2014. Retrieved 22 August 2018. ^ "Jaaroverzichten 2013: Singles" (in Dutch). Ultratop. Retrieved 22 August 2018. ^ "Rapports Annuels 2013: Singles" (in French). Ultratop. Retrieved 22 August 2018. ^ "Track Top-50" (in Danish). Hitlisten. Archived from the original on 4 February 2014. Retrieved 22 August 2018. ^ "best of singles" (Click "best of 2013"). IRMA. Retrieved 22 August 2018. ^ "Classifiche annuali top 100 singoli digitali 2013" (PDF) (in Italian). Federation of the Italian Music Industry. Retrieved 6 September 2018. ^ "Jaaroverzichten 2013 – Singles" (in Dutch). MegaCharts. Retrieved 22 August 2018. ^ "End of Year Singles Chart Top 100 – 2013". Official Charts Company. Retrieved 22 August 2018. ^ "Ultratop − Goud en Platina – singles 2013". Ultratop. Hung Medien. ^ "Track Top-40" (in Danish). IFPI Danmark. Retrieved July 2, 2013. ^ "Italian single certifications – One Direction – One Way or Another (Teenage Kicks)" (in Italian). Federazione Industria Musicale Italiana. Select "2013" in the "Anno" drop-down menu. Select "One Way or Another (Teenage Kicks)" in the "Filtra" field. Select "Singoli online" under "Sezione". ^ "New Zealand single certifications – One Direction – One Way or Another (Teenage Kicks)". Recorded Music NZ. ^ "Norway Awards". IFPI. Retrieved 31 May 2013. ^ Myers, Justin (25 August 2015). "One Direction's Official Top 10 Biggest Selling Singles Revealed". Official Charts Company. Retrieved 25 August 2015. ^ "British single certifications – One Direction – One Way or Another (Teenage Kicks)". British Phonographic Industry. Select singles in the Format field. Select Gold in the Certification field. Type One Way or Another (Teenage Kicks) in the "Search BPI Awards" field and then press Enter. ^ "American single certifications – One Direction – One Way or Another (Teenage Kicks)". Recording Industry Association of America. If necessary, click Advanced, then click Format, then select Single, then click SEARCH. ^ APFV (June 16, 2014). "Certificaciones De Venezuela Del 2013" (PDF) (in Spanish). APFV. Archived from the original (PDF) on July 15, 2014. Retrieved October 5, 2015. ^ "One Way Or Another (Teenage Kicks)". Amazon.co.uk. Retrieved 22 February 2013. 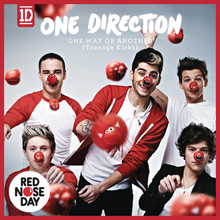 ^ "One Direction "One Way or Another" the official red nose day 2013 single". onedirectionmusic.com. Sony Music Entertainment UK, Inc. 31 January 2013. Archived from the original on 11 February 2013.